Pokémon Pinball was the second handheld spin-off of the Pokémon games. This game was released exclusively for the GameBoy Color and came in a special cartridge which include a "Rumble Pak" powered by a AAA battery, which rumbled the controller at certain points in gameplay. This is the first in the Pokémon Pinball sub-series. 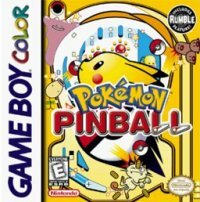 Like the main games, Pokémon Pinball is all about capturing the Pokémon, but the difference is that this is done through a game of pinball. The game is spread across two different stages, providing different challenges, Pokémon and bonuses. As with most Pinball games, the key here is to obtain the most points through hitting the various parts of the table and capturing Pokémon. However, the Pokéon you obtain only carry through the session you're playing on. Once you're out of balls, the game ends and you have to start again. This game does feature a Pokédex which helps keep track of all the Pokémon seen and captured within the game, giving details on the Pokémon as per the Pokédexes in the main game.